There are many different reasons for you to surf the web with some anonymity, not least to protect yourself from hackers, snoopers and even your own government. 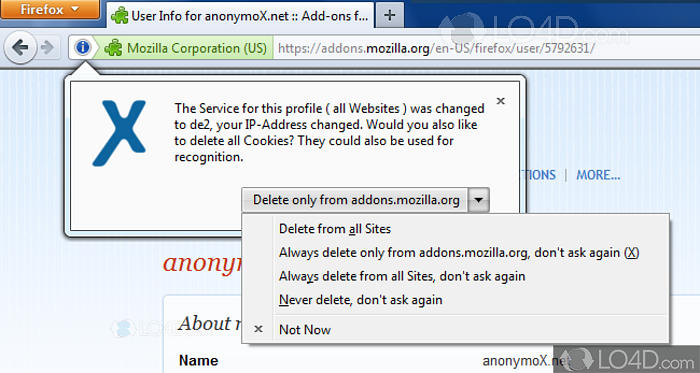 With anonymoX for Firefox, you are given several tools to enhance your privacy protection while using the browser. anonymoX is a popular tool which has the goal of providing you with complete privacy while browsing by hiding your true IP address, protecting you against intrusive cookies by third-parties and more. The addon also gives you the ability to "swap" your identity on the fly. One cool feature of anonymoX is its ability to give you an IP address from one of many regions, making it possible to get by regional restrictions and make you appear to be browsing from a country you are not currently located in. 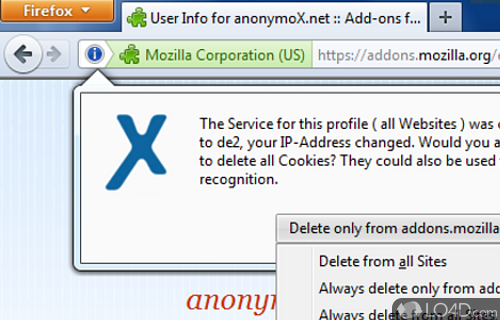 Additonally, anonymoX also helps protect you by deleting cookies and browser details thereby maximizing what you can do to block hackers and advertiser beacons. anonymoX can hide your true IP address and circumvent state censorship. anonymoX is licensed as freeware for the Windows (32-bit and 64-bit) operating system / platform from firefox addons without restrictions. anonymoX 4.3 is available to all software users as a free download (Freeware). Compatibility with this anonymous navigation software may vary, but will generally run fine under Microsoft Windows 10, 8, 8.1, 7, Vista and XP on either a 32-bit or 64-bit setup. A separate x64 version may be available from anonymoX. This download is distributed as anonymox-4.3-fx.xpi. We have tested anonymoX 4.3 against malware with several different programs. We certify that this program is clean of viruses, malware and trojans.